Métro-Boulot-Dodo. Commute-Work-Sleep. Inspired by poet Pierre Béarn in 1951, this phrase has come to symbolize the daily grind of the average Parisian. But if you want to explore the beauty of the City of Light, get out of the metro and step into the sunshine! Skip the underground transportation and catch one of the many buses that zoom through the picturesque streets, making the journey as awe-inspiring as the destination. Line 63 runs from Porte de la Muette to Gare de Lyon. The line is packed with attractions because it runs almost entirely along the left bank of the Seine, cutting through the heart of the city from east to west. Below I have outlined some of the must-see places that can be easily accessed via this route with minimal walking from each stop. As most of our Paris Perfect apartments are situated in the 7th arrondissement, we’ll start off this bus tour at the nearest stop, Bosquet-Rapp, located on the corner of the Pont de l’Alma and the Quai d’Orsay. 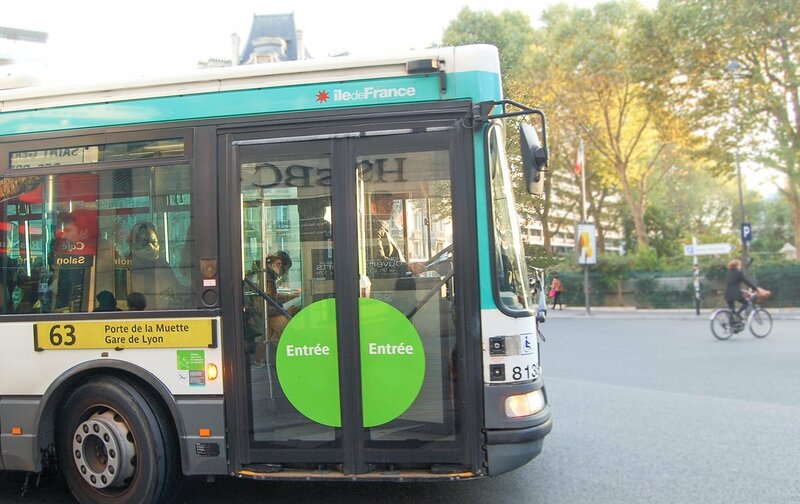 Tip: If you are planning on making several stops along one or more bus lines in a day, I would recommend the Mobilis day pass, a ticket that allows unlimited rides on all metros, buses and RER trains. Find more information about the various transportation ticket options here. 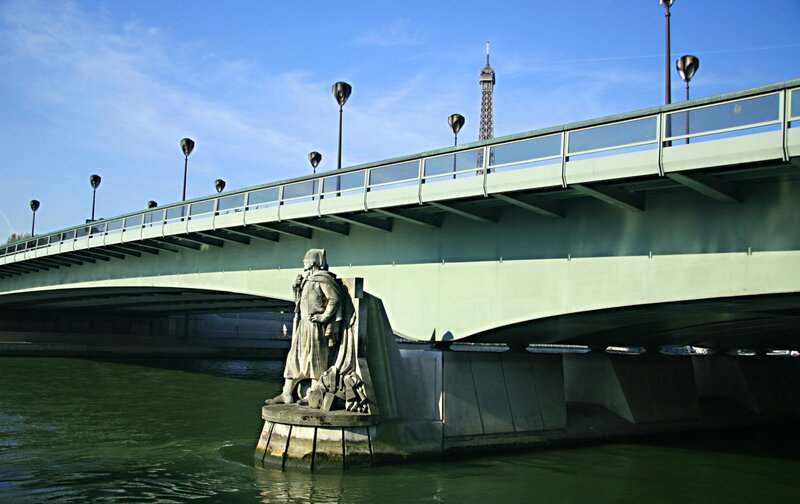 Before hopping on the bus, you can take a quick stroll over the Pont de l’Alma bridge to gaze at the Eiffel Tower and peer over at the statue of French soldier Zouave. This statue served as the mark against which flood levels were measured. By the time the river reaches his feet, the banks are no longer accessible by foot; if the water gets to his thighs, boats may no longer glide beneath the bridge. Just behind the bus stop closest to the river, you’ll find the Musée des Egouts, a less-frequented museum in Paris but one which packs a whole lot of history. Literally a museum of the sewers of the city, here you’ll see the progression of how Paris dealt with this often overlooked aspect of society, from Roman times to today. Not the typical Paris visit, but certainly a unique and worthy one. Now climb aboard bus 63 at Bosquet-Rapp and let’s go! Flanked by Avenue Marceau and Avenue Georges V, from this stop you can find high-fashion houses like Givenchy, Yves Saint Laurent and Balenciaga. 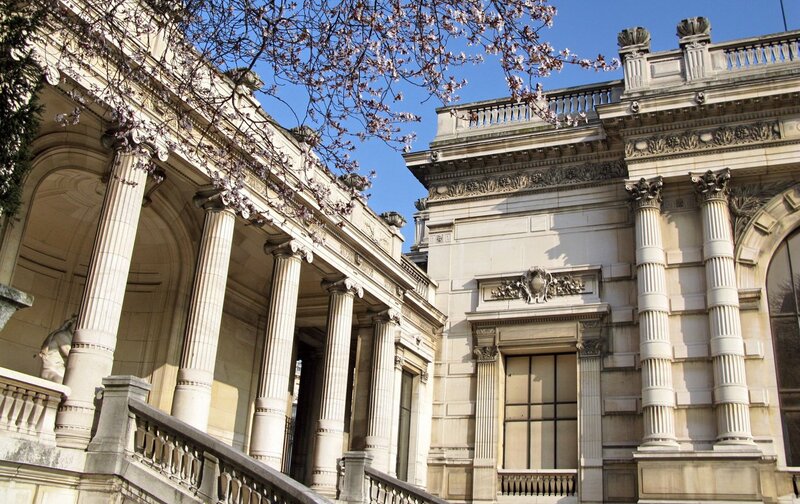 It’s no surprise, then, that down Avenue du Président Wilson is the Musée Galliera, an extensive museum that pays homage to over 300 years of fashion history. The building itself is a sight to behold — a Renaissance-style Beaux-Arts palace built by the Eiffel Company — but the treasures within make this a required stop for any fashion aficionado, from Marie-Antoinette’s haute couture garments to Audrey Hepburn’s iconic little black dress in Breakfast at Tiffany’s. Directly across the street are the Palais de Tokyo and the Paris Museum of Modern Art. Housed in the same building, the two serve similar but separate purposes. The Museum of Modern Art showcases works from the 20th and 21st centuries while the Palais de Tokyo is less museum and more active workspace: there are no permanent collections, only temporary exhibitions created on-site. On Wednesday and Saturday mornings, you’ll also find an open-air food market along the Avenue du Président Wilson. Read more about the open-air markets of Paris here. The Musée Guimet contains the largest collection of Asian art in Europe. The museum opened its doors in 1889 at the behest of Émile Guimet, avid traveler and collector of eastern art, porcelain and religious symbols. The vast collections include pieces from Afghanistan to Japan, India to Korea, and everywhere in between. Not to miss is the Panthéon Bouddhique, or Buddhist Pantheon. Although it is part of the Musée Guimet, it is located just a few doors down the Avenue d’Iéna. For a relaxing break after taking in all the art, pop into the Japanese Gardens and revel in the serenity. For a family-friendly addition to your Paris experience, visit the oldest aquarium in the world! Since 1867, the Aquarium de Paris has brought together over 10,000 fish and invertebrates, including various species of shark and coral. Plenty of activities will keep you from getting bored; you can watch the sharks being fed, play with the jellyfish, or embark on a mighty treasure hunt! You can also catch a nature film at the in-house cinema. Saturday nights, the aquarium stays open late and visitors are treated to a complementary glass of champagne. 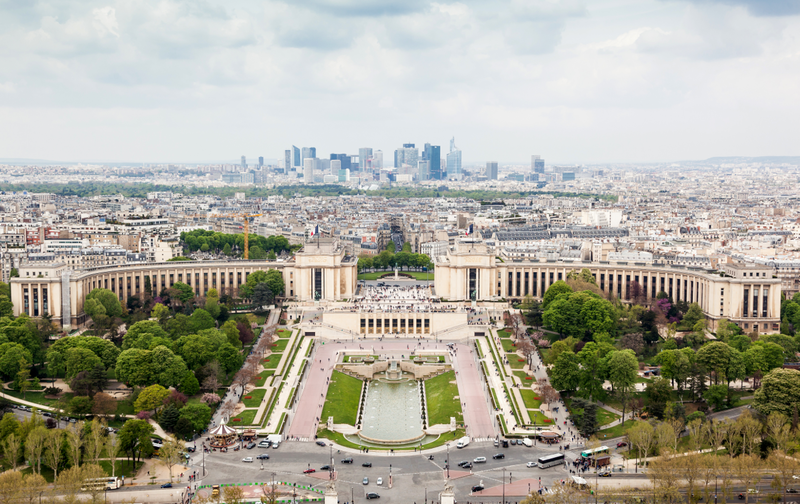 For our last stop in the direction of Porte de la Muette, Trocadéro could keep you busy for days. The biggest draw to this area is the unmatched view of the Eiffel Tower. Seriously. If you want some envy-inducing pictures, here is the place to take them. 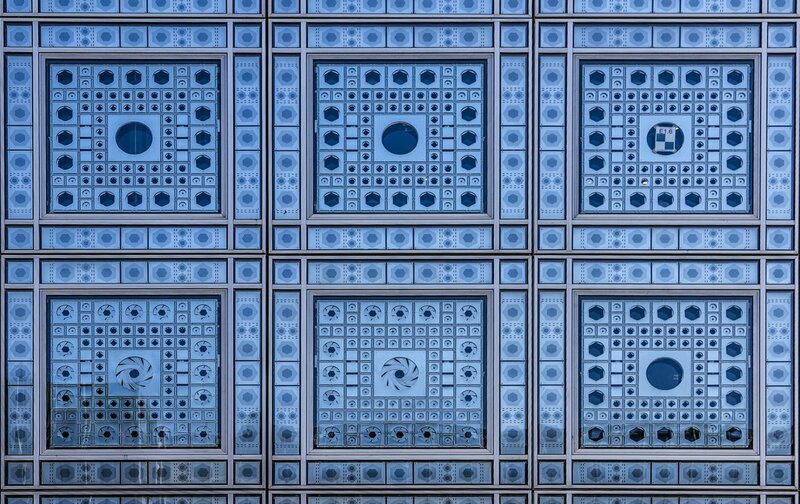 For more cultural pursuits, look to the Palais de Chaillot. Described by historian Pascal Ory as “an island of museums,” the Palais de Chaillot contains three large museums and a national theater. In the eastern wing of the Palais is the Cité de l’Architecture et du Patrimoine, the largest center for architectural history in the world. Here you’ll find scale models of numerous French monuments (aptly named Museum of National Monuments). The Cité promotes French architecture around the world. Within the same wing is the Chaillot National theater, one of the most prestigious national theaters in France. Among its star-studded roster of performances throughout the years stands the Universal Declaration of Human Rights, signed and adopted by the United Nations General Assembly in 1948. In the western wing, you’ll find the Musée de l’Homme (Museum of Man, or more clearly, Museum of Anthropology) and the Musée National de la Marine. The former is part of the network of Museums of Natural History, alongside the Jardin Des Plantes, which we encounter further down on line 63. The latter is the National Naval Museum, whose collections include weapons and models of naval vessels dating as far back as King Louis XV. Turning around now, we’ll head east in the direction of the Gare de Lyon, starting again from Bosquet-Rapp. Started as a small congregation of American protestants in Paris in 1814 — the first outside the United States — the American Church has grown into an extensive network for Christians of any denomination seeking guidance, not just religiously, but also in finding housing, jobs and friends. The church’s signature mint-green steeple and Gothic architectural style can be easily spotted while walking along the Seine. If you happen to be nearby on a Sunday around 5pm, the church holds free concerts featuring artists from around the world. 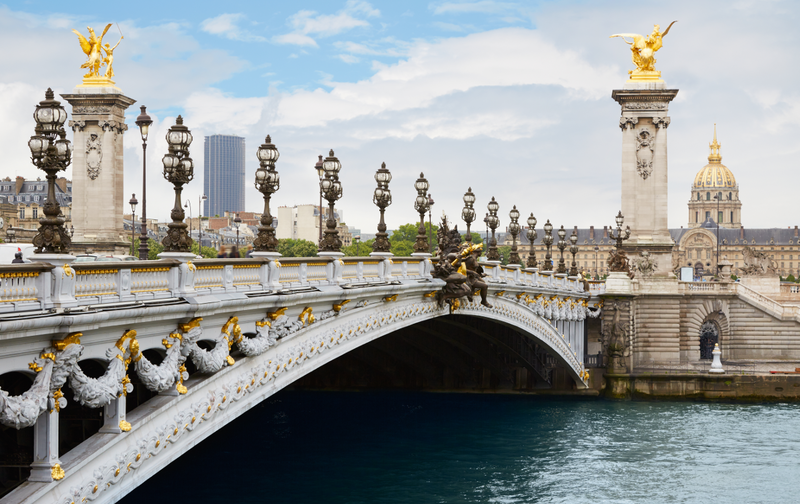 Pont Alexandre III is one of the most spectacular bridges in Paris. It transports you from the 7th arrondissement into the 8th, where you can walk past the ornate Grand Palais and pop into the free-entrance Petit Palais, then walk over to the Champs Elysées! This Beaux-Arts bridge perfectly captures the glamour and romance of Paris by day or night. If at any point during your visit you climb one of Paris’ taller structures (such as the the Eiffel Tower) you’ll surely notice this golden dome. 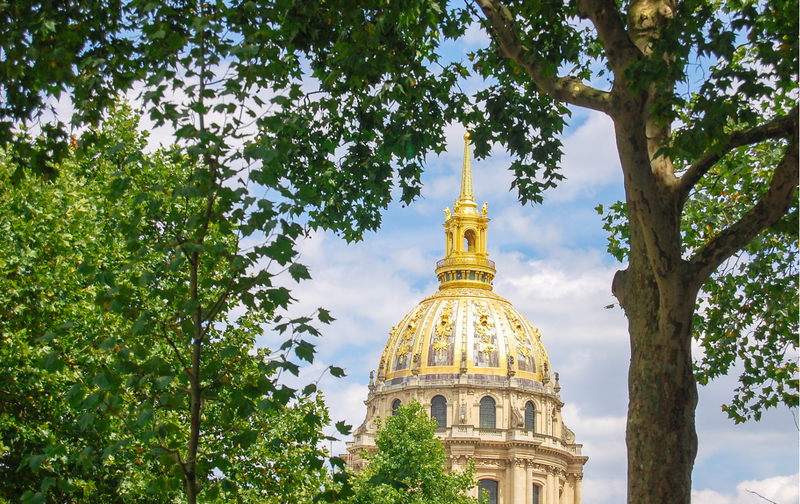 This is the Hotel des Invalides, and directly below the dome is the opulent tomb of Napoleon Bonaparte. The building still serves its original purpose of providing care and refuge for war veterans, and on any given day you might see former soldiers, French or otherwise, paying their respects. In addition, the Musée de l’Armée in the building next door takes you on a chronological tour of the the war history of France and the world, including displays of uniforms, weapons and propaganda posters. After this stop, the bus line splits depending on which direction you’re going. If you are headed east toward Gare de Lyon, the bus will take one route, but on the way back toward Porte de la Muette, the bus will make different stops. 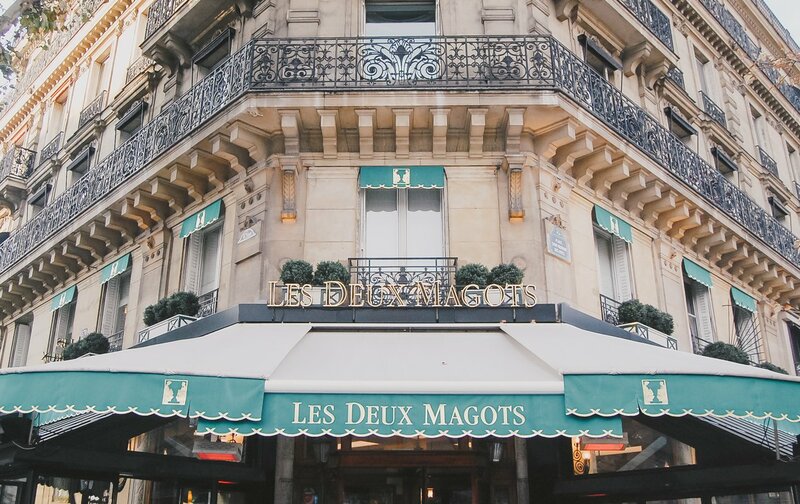 Once the ultimate literary cafés, Les Deux Magots and Café de Flore represent the rich history of intellectuals who gathered on the Left Bank of Paris. These adjacent cafés hosted the likes of Simone de Beauvoir, Ernest Hemingway, Albert Camus, Jean-Paul Sartre…the list goes on and on. Today, chic Parisians and well-heeled tourists go to see and be seen on the terraces sipping rare wines and indulging in fine cuisine. 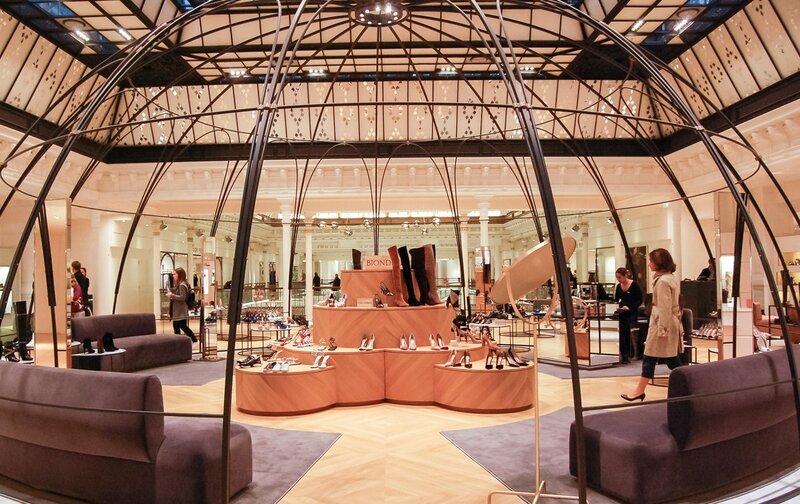 In keeping with the image of the 6th arrondissement, you can also get to a number of high-end boutiques like Dior, Hermès and Louis Vuitton for the most special of souvenirs. For some older history of Paris, you can go all the way back to when the city was called Lutetia by Julius Caesar himself. 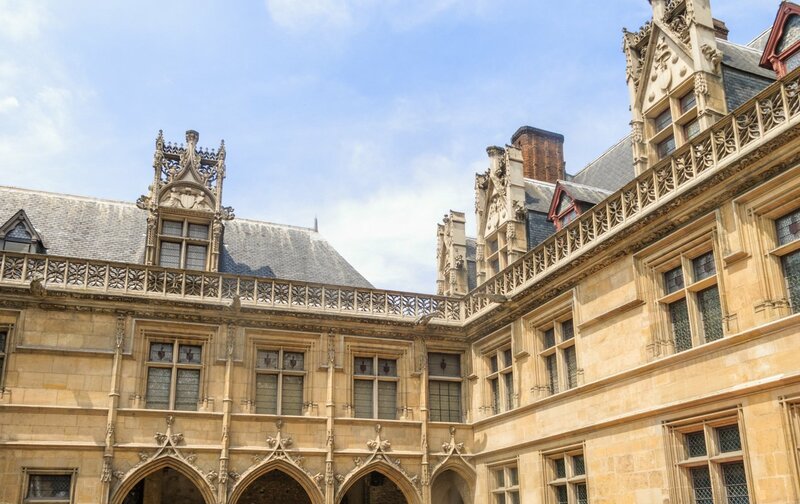 The Cluny Medieval Museum opened for business in 1843, but the structure began construction in 1334! The most notable part of the museum’s collection is the set of The Lady and the Unicorn tapestries, considered one of the best examples of medieval art in Europe. The building was constructed over ancient Roman baths dating back to the first century, which can still be seen around the outside of the museum. The tradition of public bathing is no longer allowed, however! If criminal mysteries enthrall you, do not miss this free-to-enter museum in the 5th arrondissement. 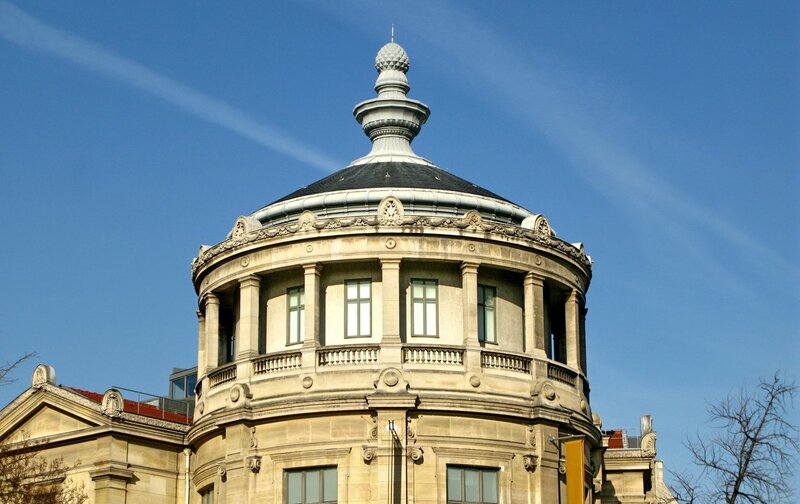 The Museum of Police holds a vast collection of intriguing evidence from some of France’s most notorious criminal cases and investigations. One of the most unique pieces within is the authentic guillotine on display, that indubitable symbol of the French Revolution. When planning your visit, keep in mind that this museum is likely to move to a larger building on the Ile de la Cité after 2017. Within this beautifully detailed contemporary-style building, a museum, library, performance arts center and three restaurants seek to share the rich cultural history of the Arab world while simultaneously promoting intellectual exchanges with France. Exhibitions can range from artifacts of ancient Egypt to Hip-Hop — From the Bronx to the Arab Streets. For a moment of relaxation, stop by the café Littéraire to indulge in some delicious teas and pastries, or head on over to the Zyriab Restaurant for panoramic views of the city and a full gastronomic menu. 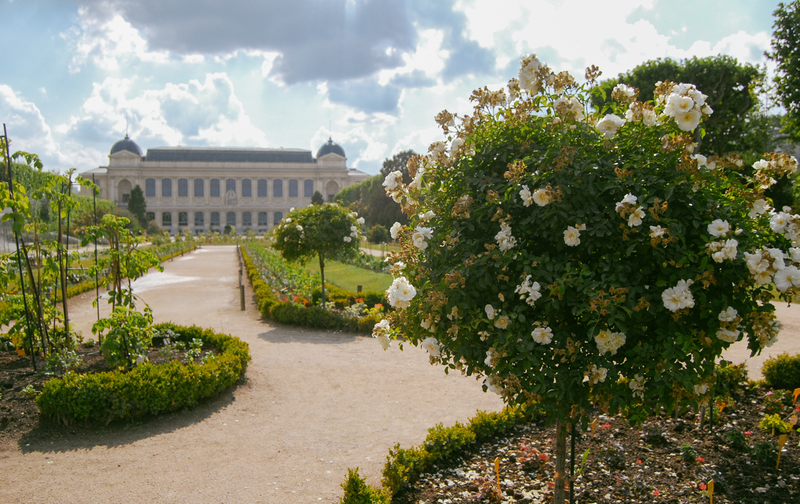 Three parts natural history museum, zoo and botanical gardens, the Jardin des Plantes offers a natural respite from the busyness of the rest of the city. Joining the Musée de l’Homme in the Network of Natural History museums, the Jardin encompasses four main galleries in which to wander and wonder about the planet around us: the Gallery of Evolution and the Mineralogy, Paleontology and Entomology Museums. Once outside, you can take a gander at the animals in the Ménagerie, originally located in Versailles but moved here in 1795, and at the expansive botanical gardens where future French botanists are still trained. After this stop, the line will drive by the Gare d’Austerlitz and then take a left across the Charles de Gaulle Bridge, reaching it’s final destination going east, the Gare de Lyon. This station is one of the busiest in the country. Hop on to a high-speed train here, and you can head to cities in France such as Lyon, Avignon and Marseille, or even international destinations like Barcelona, Zurich and Venice. Now that you’ve reached the final stop on this bus line, get back on to visit the stops where the line splits! Here are the last few stops you’ll encounter on your way back towards Porte de la Muette. Just up the street from this stop, the Panthéon stands tall atop the Sainte-Genevieve Hill. 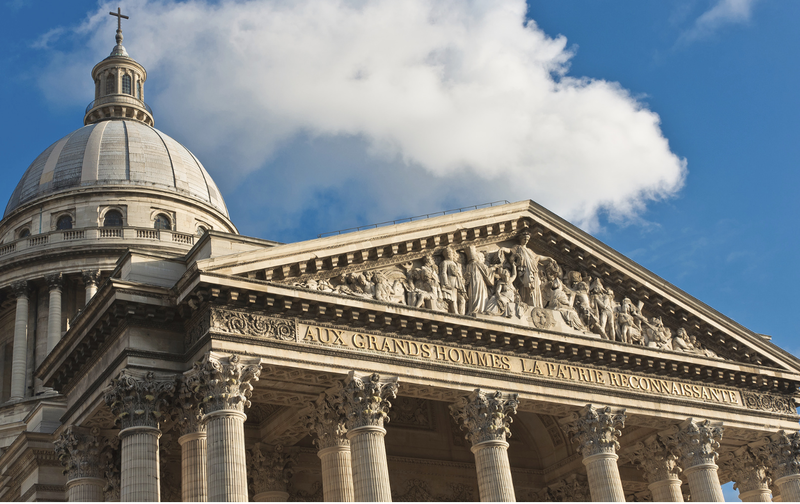 Originally a church, the Panthéon now serves as mausoleum for some of France’s most renowned artists and intellectuals, including the likes of Voltaire, Émile Zola, and Victor Hugo. Inside you’ll find Foucault’s Pendulum, hanging down from the dome to demonstrate the Earth’s rotation. The building’s dome was recently restored, and it is once again possible to climb to the top for an excellent view of Paris. 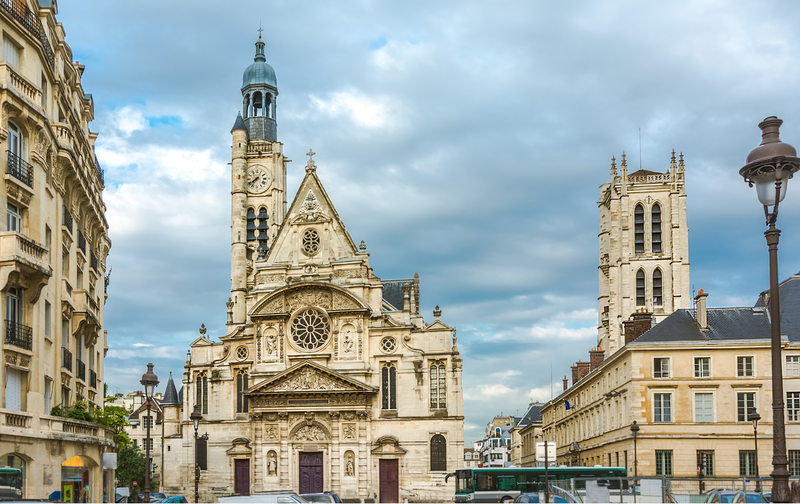 Behind the Pantheon, you can take a peek at the Sainte Etienne du Mont Church, honoring Sainte Genevieve, the patron saint of Paris. You may recognize the set of stone steps on the side of this church, as it was where Gil Pender would begin his time travelling in Woody Allen’s Midnight in Paris. 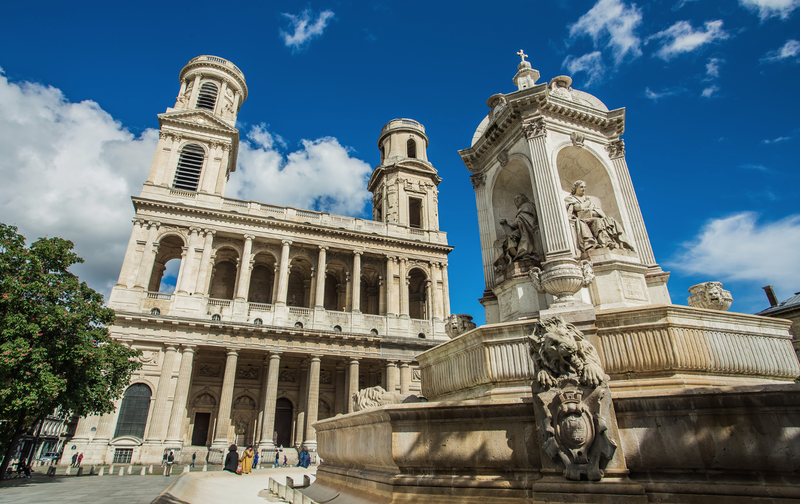 Only second to the Notre Dame in size, Saint Sulpice is a striking church unlike any other in Paris. In 1732, Giovanni Servandoni won a design competition to reimagine the west façade of the church, inspired by Saint Paul’s Cathedral in London. However, Servandoni’s original design plan was thwarted after his death, due to interruptions such as the French Revolution and lightning strikes. As a result, the church became a combination of varying architectural styles; from Baroque, to Neoclassical to Rococo. For our final landmark on line 63, we’ll be stopping at the first ever department store! At the time of its inception, Le Bon Marché brought about numerous novel ideas to the world of retail. Under one roof, it would sell a variety of wares, from textiles to mattresses. Just as revolutionary was the institution of the fixed price system and the ability for returns and refunds; a customer could walk in and know right away the cost of an item instead of needing to order custom-made garments and goods. Today, Le Bon Marché continues to be a hallmark of Parisian shopping. From here on out, the notable stops merge once again and you can just follow this guide in reverse. Bon voyage! Posted on Tuesday, September 6th, 2016 at 6:16 pm in See & Do. You can follow any responses to this entry through the RSS 2.0 feed. You can leave a response, or trackback from your own site. 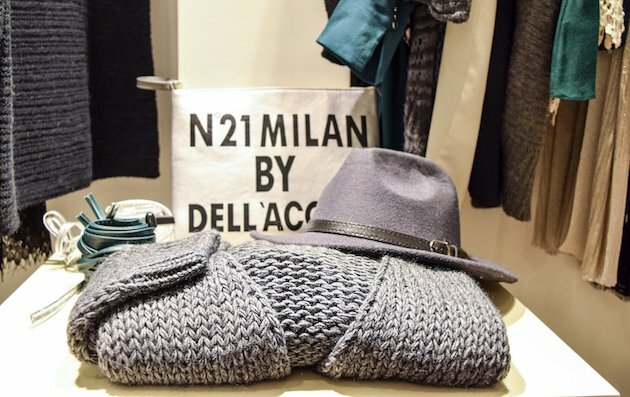 Two Parisian Clothing Shops That Won’t Break the Bank! The Best Jogging Routes on the Left Bank of Paris Skip the Line Eiffel Tower Tour The Best of Rue Saint Dominique – The Hottest Street in the 7th!